The Facebook post was deleted within hours after publishing. 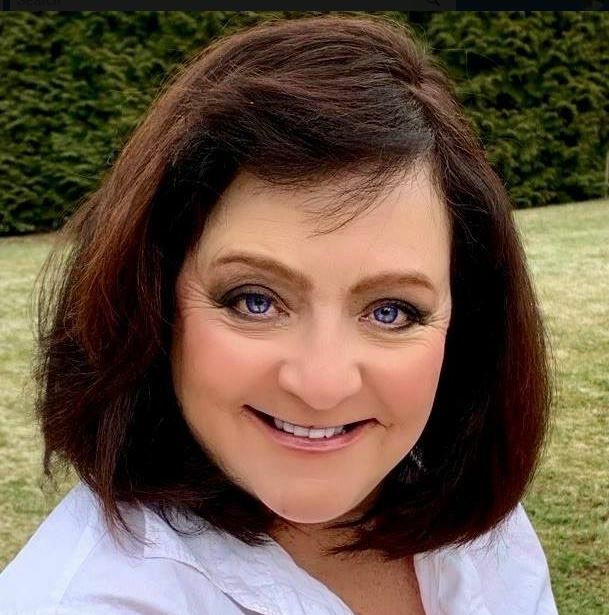 However, the Village calendar confirmed the date and time of the hearing of the Electoral Board, which, as we later learned, was to review a complaint challenging the petition of trustee candidate, Linda H. Cools, due to alleged violations of election rules. The complaint alleged Cools had turned in her petition with an excess of signatures over what is allowed on the nomination ballots and that her signed statement of economic interest was filed in the wrong county. It seems filing campaign paperwork that does not comply with Illinois statute was also the reason Cools was not on the ballot and could only run as a write-in candidate for trustee in 2017. “Electoral Board, my name is Linda H. Cools. I’m a resident candidate for Village trustee in the Village of Barrington Hills. Although I have not been properly served by the Sheriff of McHenry County as required based upon the requirements outlined by the State of Illinois Board of Election, proper service was not executed; therefore, the hearing should be dismissed solely upon that one singular fact. However, I intend to strenuously refute the objector’s petition regardless of this Board’s decision whether by appeal and presentation as part of the official public record. This is not an impartial, independent board but rather one with a vested interest in this outcome. Nevertheless, I appear in good faith before you to present my oral argument against the objector’s petition. I’m going to skip to the next page if you give me a second to do that. Konicek Hannigan: Ms. Cools, are you denying that you received service of the objection? Cools: I was not aware of any service or any receipt of any service. Konicek Hannigan: So you’ve never received a copy of the objection? Konicek Hannigan: Then why are you here today? Cools: I received an email. I have an email notifying me from the grapevine that I was to appear here, but I did not receive anything in writing or any other information to come here to the Village. I have not received proper service. Konicek Hannigan: Okay. You’ve actually written in public blogs about having been served with an objection. Cools: What public blogs? I don’t run a public blog. Cools: I don’t run any public blog. Konicek Hannigan: On social media? Cools: I run no public blogs. Cools: I don’t run any social blog, social media, print media, nothing. Konicek Hannigan: Okay. 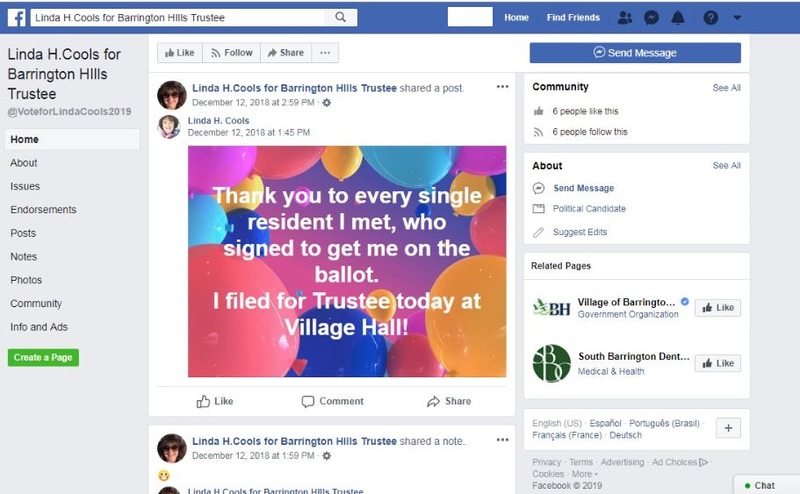 So the Facebook page Linda Cools for Barrington Hills Trustee is not your page? Cools: I have no information to share on that. Konicek Hannigan: Okay. Are you denying that that’s your Facebook page? As for the two filing errors, the Electoral Board continued the hearing to January 8, 2019, and allowed the objector and respondent to file additional statements. At that hearing, the Electoral Board voted unanimously to allow Cools to amend her statement of economic interest, and held, on advice from the Village Attorney, that the excess number of petition signatures would not act as a bar to Cools’ being on the ballot, despite the fact that it was a clear violation of Illinois statutes and election rules. The Village Attorney referenced a federal court case that discussed striking a candidate for having excessive signatures as being unconstitutional. He also stated that there was a clear discrepancy in federal and state law and that Illinois case law favored striking her name from the ballot, but the U.S. Constitution was the law of the land. Still, this does not change the fact that statements were made by Cools, under oath, in a public forum while giving her testimony on December 31, 2018. As a side note, someone once said the Illinois Board of Elections would likely approve a candidate’s paperwork if it was written in crayon. If this is true, given Ms. Cools’ problems completing paperwork accurately in two consecutive Village campaigns, she might be well advised to invest in a box of Crayola Crayons (preferably no more than 10 colors, PLEASE) the next time she must file for nomination in 2020. It should be noted that some time after the December 30th hearing Cools retained an attorney who appeared on her behalf at the continued hearing of the Electoral Board on January 8, 2019. At that time, prior to proceeding with argument, Cools’ attorney withdrew certain statements Cools made at the prior hearing to the effect that the Electoral Board was “not an impartial, independent board but rather one with a vested interest in this outcome.” Cools’ attorney agreed that there was no evidence to substantiate the comments, and Cools herself agreed on January 8th that she had nothing to support those statements and they would be withdrawn. She claims to espouse transparency yet her video recording of the Election Board hearing has been taken down. There’s one election promise down the tubes. Will the Cook County State’s Attorney hearing be live streamed? Will she even show up to the State’s Attorney hearing? Didn’t show at Daily Herald interview or League of Women Voters forum. Was that also on the advice of counsel? “Money for this Go Fund Me page will be used to purchase a copy of the Barrington Hills Board of Election transcript for the second hearing. We have yet to receive actual invoice information from PohlmanUSA and this amount is merely an estimate of costs. Overages may be used for legal services if needed. This transcript we are requesting represents the January board of election hearing wherein the village of Barrington Hills presently states they did not obtain a copy of the transcript as it was deemed ‘too expensive’. The hearing was initiated by resident and zoning board committee member Cernick as an objection to candidate Linda Cools’ inclusion on the ballot. Yes, the village deemed this hearing transcript is not worthy of public record. We disagree. Help us stand up for full transparency and accountability in Barrington Hills.